Recently updated via FAQ, the first company of the Dark Angels has returned as an option for modern competitive warhammer. But is it a good option? Well, they don't call them the Deathwing because they volunteer at the old folks home. 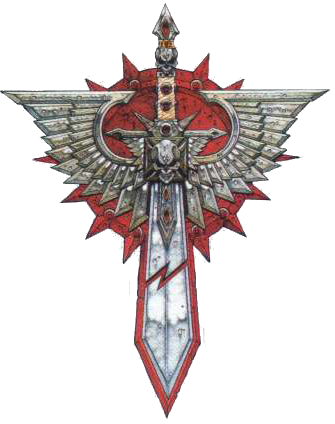 See what I think about the history and current position of the classic 40k army. First, some background. I started playing 40k during third edition. Everyone was down about the recent changes from the awesomeness (insanity) of 2nd edition, but I was excited to start playing a game I had only seen and never played. The important consideration of which army to play was at hand. Now, prior to shelling out my limited funds (I was in High School), I had played a bit using a friends space marines. Knowing little about the game, I simply selected units that seemed cool. The coolest of the cool were Terminators, the most heavily armoured infantry in the game with some cool and unique weapons. After a few outings with them, I realized I liked them a lot. Upon hearing that one chapter of space marines could field and army of ALL TERMINATORS, I nearly crapped myself. I became a Deathwing player. Unfortunately, other things crept up that took me out of playing 40k for quite some time, and upon return I found that not only were Deathwing not the only all terminator army around, they were actually the worst all terminator army around, having been sat in the corner with a dunce hat after a lackluster 4th edition update and, more importantly, the update of the Space Wolves codex and the introduction of Logan Grimnar and his Wolf Guard Terminators. I was disappointed, of course, but decided to just refocus onto using other components of my Dark Angels army until (eventually) they got an update. Luckily, I didn't need to wait that long as in an unprecedented move, GW updated them (and Black Templar) via a FAQ and immediately restored them to legitimacy. But they still had some glaring weaknesses, but also had some unique strengths. 1) Mixed Weaponry: While other armies may field terminators, they cannot field terminators armed however they want. Specifically, they generally have to outfit them for assault or for shooting and must forgo the other entirely. Deathwing Terminators are fully customizable between their assault and shooting layouts. 2) Storm Shields for All: For the standard price of 43 points per model, any Deathwing Terminator can have a Thunder Hammer and Storm Shield. This gives the entire unit a 2+ armour save and a 3++ invulnerable save. This makes them the most durable individual troop selection in the game. 3) Fearless: Deathwing Terminators are fearless. This is really nice for shooting, while it is a mild liability when in CC. However, having a 2+ save for no retreat wounds is about as good as you could hope for. 4)Limited numbers: Deathwing Squads are always 5 models, they can't be bigger then that. They can only have a single special weapon per squad (Heavy Flamer, Assault Cannon or Cyclone Missile Launcher). The max number of Deathwing Terminators you can have in an army is 30. 5) Feel No Pain: One Deathwing Squad can have an apothecary, giving that unit Feel No Pain. Essentially, they become nearly immune to small arms fire. So, I have explained some aspects of the army, lets see how it looks when it comes together. Below is my sample list for the Bay Area Open (which I may fail to attend, but we will see). An 1850 points army list with 5 vehicles and 26 infantry doesn't typically scare people, and I understand. That is not a lot of bodies. But while numbers suffer, there are some huge upsides. Every one of those infantry is 2+/3++ with Fearless. 6 of them have FNP. They all have 2+ Str 8 Thunderhammer attacks in close range. At longer range, the list can fire 16 Krak Missiles, has 3 Multi-Melta's for heavier armour and a pair of Demolisher Cannons for clearing out larger squads (the place where numbers truly matter). Every single shot or attack in the army hits at Str 8 or higher. While it is sometimes hard to argue quality over quantity in 40k, this is a lot of quality, and while it lacks manuverability to some degree, you still the opportunity to Deathwing Assault (first turn: 1/2 your deep strikers arrive automatically) and can essentially ignore cover in favor of your high level saves. In fact, they terminators provide a moving wall for the Vindicators, who will enjoy constant cover due to the prescence of the bulky terminators. While far from an unbeatable list, the army offers significant upsides when compared to other more modern termie based armies. Don't be so quick to write them off due to their 4th edition codex, or find yourself caught offguard by the stark white armoured terminators marching forward to pulverize your lines. The third place guy in the league I just played in was using a similar list. I believe he had one more termie squad in place of the speeders and predators instead of the vindis. I didn't get a chance to play him, but it looked like a pretty brutal army.